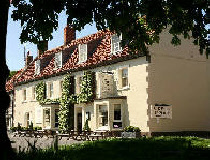 Dating from the seventeenth century with additions from the 18th and 19th, The Hoste Arms is a former coaching inn which today offers over 30 guest rooms. Located in one of Norfolk’s most beautiful villages, its most notable claim to fame is that it was here that Lord Nelson would receive his dispatches every Saturday between 1788 and 1793. The building was also once owned by the Pitt family - relatives of the political dynasty. Rooms 1 to 8 are those situated in the oldest part of the building, with number 5 being that in which Lord Nelson is reputed to have slept. Others are to be found at the rear of the property and also within the courtyard wing where the hotel’s beauty spa is located. The Hoste Arms also features its own restaurant (2 AA Rosettes). Burnham Market itself is a particularly attractive village, while other historic towns such as Hunstanton and King’s Lynn are close by.